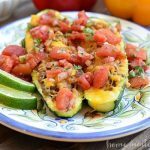 Zucchini stuffed with spicy ground beef and topped with cheddar cheese and homemade salsa. Cook all vegetables together in skillet until soft and set aside. Brown ground beef and add chili powder and cumin. Lightly salt the zucchini boats and fill with beef and vegetable mixture. Put boats in a casserole dish and cover with cheddar cheese. Bake for 20 minutes or until zucchini has softened and cheese is melted. Pour salsa over boats before serving. Eat right away or cover and refrigerate for later.